Most treatments for dandruff are formulated into a shampoo. Many of these over the counter flaking scalp treatments are medicated. Incredibly most are harsh to the scalp and even harmful to the scalp's delicate hair follicles and often make the itching flaking scalp problem worse rather than better. Menthogen was originally developed as a Anti Dandruff Formula for (trichology) clinic use only and therefore could only be obtained though a registered practising hair and scalp expert (trichologist). Menthogen has a number of key uses where it is very effective. It's a lotion that is applied directly to the scalp daily. Once it has been applied it is left to work on the scalp. Shortly after application a pleasant cooling tingling feeling can be experienced as the product starts to work. Menthogen works all day to control and eliminate dandruff. Regular use creates an scalp not only free from dandruff, itch and flaky skin but one with an optimum scalp condition. Often a scaly scalp will be irritated and become itchy. Scratching make it worse and usually mild skin infection develops. Leading brands of anti dandruff shampoo bought from pharmacies or supermarkets actually make this worse! It's worth remembering that a consultation with a trichologist (expert hair and scalp specialist) that is registered with the Institute of Trichology (London) will always charge for the consultation whilst trichologsts registered with other organisations may offer free consultations though often their clients may leave bearing hundreds of pounds worth of hair and scalp products - or a commitment to that effect. 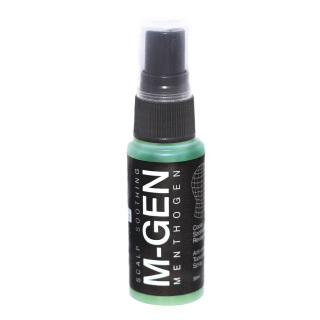 Menthogen was developed by a UK team of expert trichologists and hair/scalp product development specialists for the treatment of scalp related maladies and is available here without expensive consultation or doctor's prescription.